Want to know when the next meteor shower happens? This version is 64 bit compliant so it should run fine under iOS 11 when it arrives. 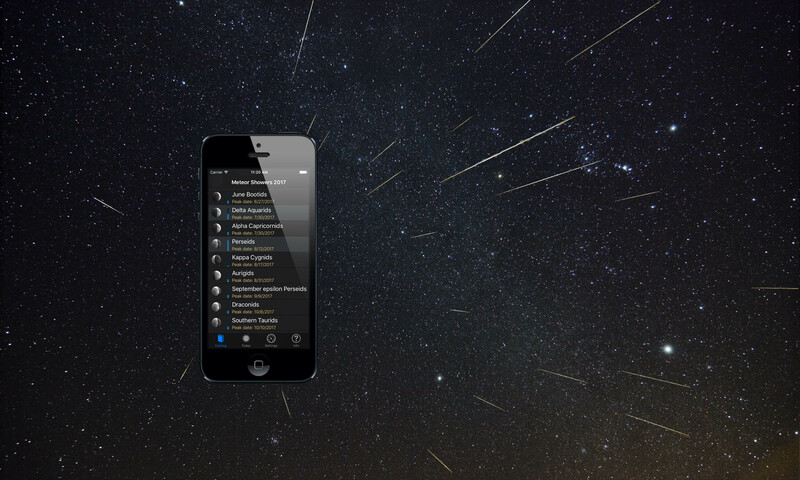 Latest version of Meteor Shower Guide has been released to the Apple App store. Page is still showing the last version as I write but it should update soon. With iOS version 7.0 when adding an event to calendar the app would crash. With this new release all future versions will require iOS 7 or newer. To support older devices I’ve kept the previous version available. August 7th the latest version of Meteor Shower Guide was released to the App Store. The new version features a revised layout and color theme. Moon phase graphics were expanded to cover each day of moon age. Unfortunately I did not upload new screen shots to the App Store prior to this release. I forgot that Apple now requires screen shots to be updated in a specific sequence before the app is released. There will be a 1.5.1 update next week just so I can get them updated. Comments are no longer allowed on posts, too much spam. This is why we can’t have nice things. Meteor Shower Guide version 1.4.0 has been submitted for review and will be available for update in the next week. This version supports the iPhone 5 screen size. But, because of this update the minimum version of iOS required has changed to 4.3. This means older devices like iPhone 3 and iPod 2nd generation can no longer run the latest update. Do not update your app if you use the early devices. This minimum iOS requirement is from being compiled with Xcode 4.5, an Apple requirement for iPhone 5 support. If there is enough interest I could investigate creating a new app specifically for the older hardware. Support for iPhone 5 larger screen. Catalog list and shower detail page layout updated. Updated shower detail page to fix peak time being truncated due to GMT offset value, verses shorter three letter time zone code. Improved calendar alarm detail, added note for peak day, time and location so this is immediately available in the calendar entry. Meteor shower database update: Orionids solar longitude value changed from 208.0 listed by IMO to 208.4 based on past two years observer data compiled by IMO. Minor updates to fonts and layout. Updated several meteor showers in the app database to use the IMO Solar Longitude value. A few entries differed slightly without supporting documentation as to why that should be the case (in particular the Quadrantids!). Shortened App display name, using MeteorGuide instead of MeteorShower. The name is being truncated on Retina displays. Fixed end of year scrolling behavior when app starts. When a meteor shower was not found after the current date it was not scrolling to end of list like it should. Added a possible fix for the iOS 5.0 and greater Calendar entry problem and report any error if event is not saved. For some unknown reason the Calendar does not update with an event under iOS 5. This problem does not show up in testing or operation for me and nobody has ever properly reported the problem so I was unaware of it until December. The internal database update changes a few meteor shower timings, in particular the Quadrantids. Version prior to this one had a value of 283.4 which results in a time about six hours later than using the IMO value of 283.16. Of all the significant meteor showers the Quadrantids have the narrowest shower peak and six hours was a significant error. Oddly the shower this year (excellent by the way) had a slightly later and broader peak so it fell between the IMO prediction and my errant prediction.